The following Stations of the Cross offer reflections from Catholics in Arkansas. They are accompanied by illustrations from indoor, outdoor and live stations at churches and monasteries across the state. Together the meditations and artwork show the beauty and diversity of God's revelation to humanity. 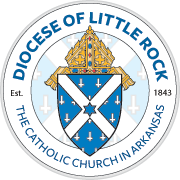 The Diocese of Little Rock may encompass the entire state of Arkansas, but we are one in the body of Christ. Order on DVD. What are the Stations of the Cross? — This ancient, Lenten meditation now consists of 14 stations, taken both from Scripture and tradition, that focus on the passion and death of Jesus. Walking in the Footsteps of Christ — Explore the "Via Dolorosa" ("Way of the Cross") in Jerusalem that follows the route believed to have been taken by Jesus when he was crucified. Stations of the Cross in Parishes — Visit our calendar to find parishes in the Diocese of Little Rock that offer the stations on Fridays during Lent. Or contact a parish directly to find stations near you. Stabat Mater — The ("Mother was Standing") is a 13th-century Catholic hymn about Mary's pain at the foot of her Son's cross. The message of the hymn focuses on the bond that unites Mary and all Christians to the death of Jesus on the cross.